Photographing Battery Point Lighthouse requires advance planning due to ocean tides. Free tide reports can be found under the "Maps and Resources" tab located in the black bar at the top of the screen. Download free directions, maps, GPS and photo advice for Battery Point Lighthouse by selecting the Maps and Directions tab above. Battery Point Lighthouse was one of the first lighthouses on the California coast. Rugged mountains and unbridged rivers meant coastal travel was essential for the economic survival of this region. In 1855, Congress appropriated $15,000 for the construction of a lighthouse on the tiny islet, which is connected to Battery Point by an isthmus at low tide. Although not included in the 1852 contract by the United States Lighthouse Service for the first eight west coast lighthouses, the Battery Point Lighthouse was actually lit ten days before the Humboldt Harbor Lighthouse, the last of the original eight to become operational. The fourth-order Fresnel lens was lit in 1856. The lighthouse was automated in 1953, and a modern 375mm lens replaced the fourth-order Fresnel lens. Theophilis Magruder was the station's first keeper; Wayne Piland was its last before automation in 1953. The 1964 Alaska earthquake, the strongest earthquake ever recorded in the northern hemisphere, caused a tsunami. The lighthouse survived, but the following year, the modern beacon that replaced the Fresnel lens in the tower was switched off, and a flashing light at the end of the nearby breakwater served as the harbor's navigational aid. In 1982, the light in the lighthouse tower was lit again, and the Battery Point Lighthouse was listed as a private aid to navigation. The Del Norte Historical Society operates the Battery Point Lighthouse and Museum. The lighthouse is open to the public only when low tide permits access, daily from April through September with tours between 10 AM and 4 PM. October through March, the lighthouse is open for tours on weekends, from 10 AM to 4 PM. In both seasons, visits to the Battery Point Lighthouse and Island are only possible at low tides. It is recommended that you research tide times before visiting, as the tide rises very quickly at the point and the land bridge to the lighthouse can disappear rapidly. The museum includes the lighthouse keeper's quarters with period furniture and artifacts left behind since the 1850s, as well as displays of maritime artifacts, photos and historical documents. Tours include a climb into the light tower. 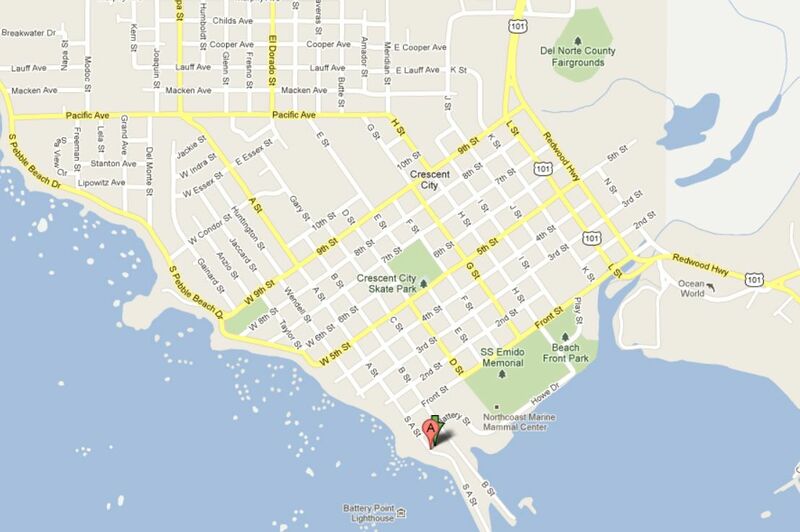 You can call (707) 464-3089 during these hours to learn when the tide permits access to the island. Driving Directions: From Highway 101 in Crescent City, go west on Front Street until it ends at A Street. Turn left onto A Street and follow it to the parking lot at its end. For Google Maps driving directions to Battery Point Lighthouse click the green "View Map" icon and then select "Get Directions" in the upper left hand corner of Google Maps. Photographing Battery Point Lighthouse requires advance planning due to ocean tides. Free tide reports can be found under the "Maps and Resources" tab located in the black bar at the top of the screen. The ideal conditions for photographing Battery Point Lighthouse is when high tide and sunset match one another. During high tide the sweeping ocean waves crash over exposed rocks creating a interesting foreground. During low tide the foreground leading to the lighthouse is rocks and seaweeds. This photo was fifty percent planning and fifty percent luck. The high tide was planned using free tide reports from Freetides.com while the torques glow of Battery Point Lighthouse was a eight second window of luck. When the flood lights that illuminant Battery Point Lighthouse are first turned there is a 10 second window until the lights heat up. During that 10 second window the lighthouse has a bluish glow seen in the photo. Timing high tide, crashing waves, guide light, flood lights and cloudy skies is merely luck captured on film in this photo. This photo was taken from a concrete pier that leads out to the new guide light built in 1982. Advance Planning: Battery Point Lighthouse sits at 230 degrees from this photo location. Download a free copy of the Four Factors of Filter Highlight Photography in PDF format by selecting the “ebook download” tab above. This 37 page guide covers how to take a single image and apply minor manipulations that will help you produce consistent reproducible results. You will also learn the processes of camera set-up, image editing, and advance scouting techniques used by professional photographer Christian James. Free park maps, tide reports, ebooks and additional information can be found under the Maps and Resource tab located in the black bar at the top of the screen. The best time to photograph this locations is sunset. Nikon D3x 24-70mm Lens @ 35mm f11@ 30 seconds ISO 500 Exposure Value -0.7 with a 3 Stop (0.9) Soft-Step Spilt ND Filter. 4/30/12 7:56 p.m.